Commercially available in September 2016! 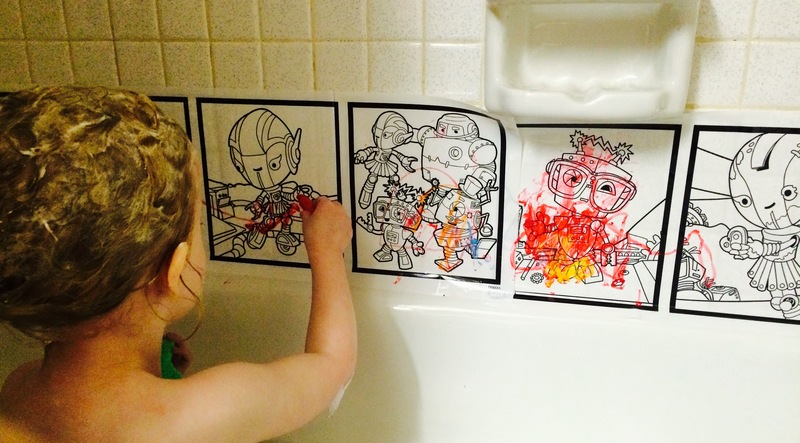 I was super excited that SAVVi was coming out with a brand new product made just for coloring in the bathtub. My youngest child is at the stage of toddler-hood where it’s a 50/50 chance as to whether she wants to take a bath. It’s not enough to just say, “You don’t want to be stinky, do you?”…it’s more of a want to keep playing and I have to make the bath seem enticing when she is not in the mood to get clean. I’ve become quite a master at this from making fizzle bath water, using glow sticks, and one of my personal favorites I learned with my oldest child is that COLORING on the bathtub is super fun! However, it usually meant momma had to scrub out the bathtub each night, which quite honestly, was worth it to get bath time complete with no complaints. 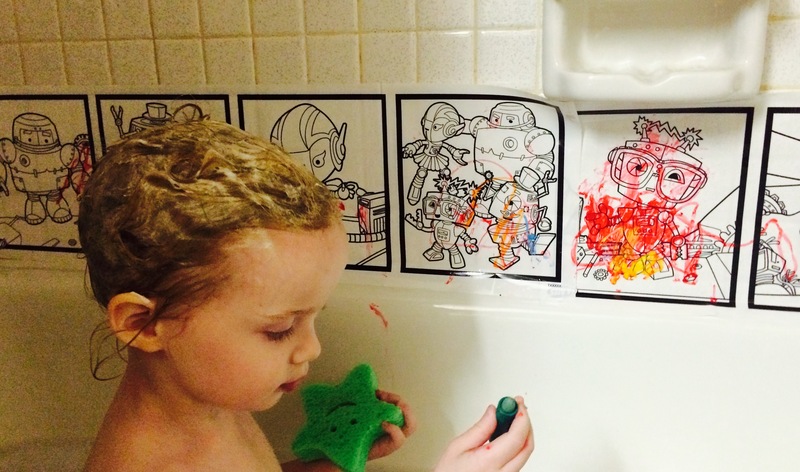 However, SAAVi made a genius move in creating a bathtub “Color-in-Cling” where instead of using bath crayons on your tub, your child has cling sheets that easily stick to your bath tub walls that you can color on – OVER AND OVER again. Yes, I’m calling this a genius product because it works! SAVVi’s Bathtub Coloring Kit offers bath time excitement and is geared towards children 3-6 years of age. 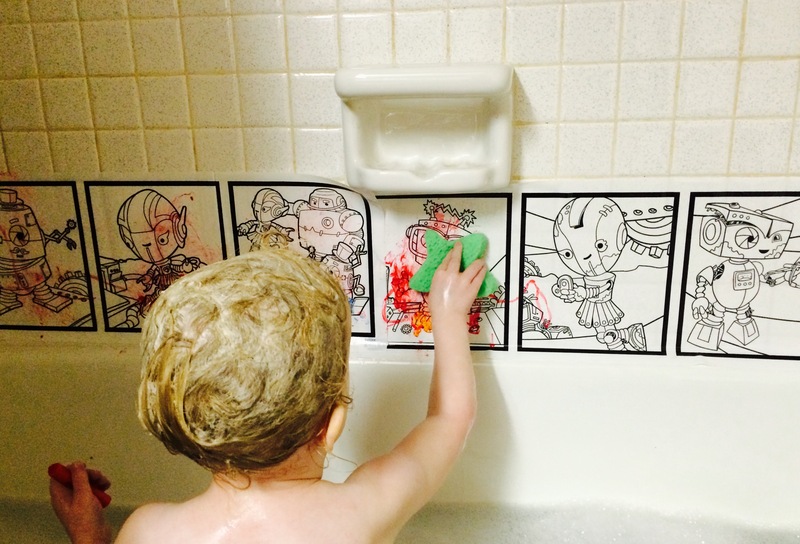 The Color-in-Cling is a bath tub art medium where baths become an artistic play time and children are encouraged to express themselves artistically by coloring on the walls. Don’t freak out, the kids won’t be coloring on the actual walls, of course, but a cling that will adhere to surfaces (smooth surfaces are best) when wet. 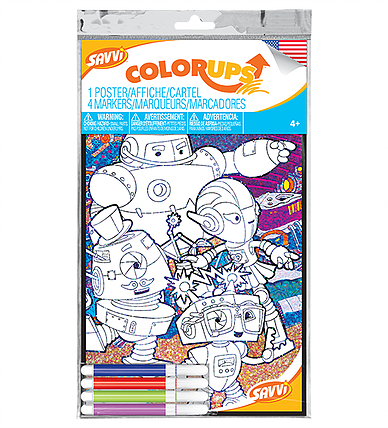 The kit is available in lots of different SAVVi characters (we have the Blunder Bots character clings) and it comes with two generously sized coloring clings which can cover a total of 430 square inches of bath tub wall surface so the kiddos can have a huge palette in which to color. The kit has 6 colorful crayons that are water compatible and skin safe. I love that each cling features 4 different coloring scenes that are 6”x6” in dimension. My favorite part (besides Brie being excited to take a bath!) is that the kit also includes a character sponge and 2 compressed washcloths that both my girls like to use to wash up their clings (and any additional surface the bath tub crayons may have gotten). It was hilarious to see the look on Brie’s face the first time she saw the washcloths expand in the water for the first time! Ha. This bathtub coloring kit is a favorite for both our girls and when Brie knows it’s time for her bath she is almost always ready to say, “Ok! Bath time!” Priceless. Check out the SAVVi Themed ColorUps™ – Artwork for Outside the Bathroom! About SAVVi: SAVVi is the premier US manufacturer (out of Arizona) of printed novelty products! Their products are sold worldwide and are available in most major retail stores across North America. 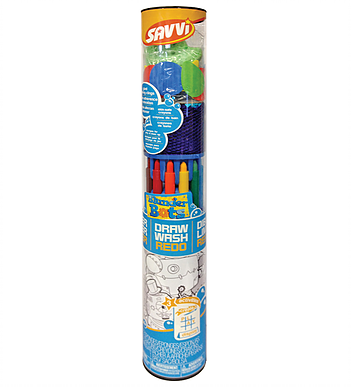 In addition to being the world’s largest manufacturer of temporary tattoos, SAVVi also produces a wide variety of craft and children’s activity products.